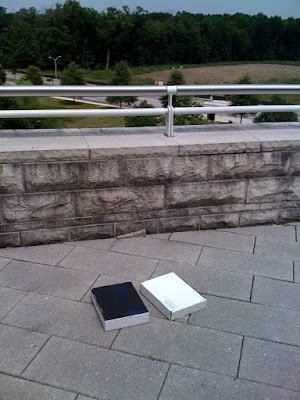 We then placed our newly black-roofed box and regular white box out in the sun, each equipped with an (admittedly low-tech) mercury thermometer. Then we went to lunch—a crucial step along any avenue of scientific inquiry. 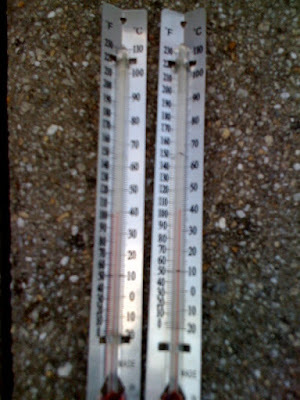 When we returned from lunch, we eagerly opened up the boxes and placed the thermometers side by side. How big of a difference would the white "roof" make? 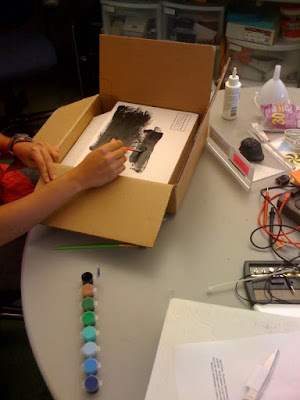 The Cool Colors Project has links to the facts they've accumulated and recent research papers. I learned on the site that what makes a white roof cool is its ability not only to reflect sunlight, but to emit heat. A roof with a clean, smooth bright white surface can reflect about 85% of incident sunlight (R = 0.85) and emit thermal radiation with 90% efficiency (E = 0.90). In the end, this means that the roof's temperature creeps up only about 9 degrees. In contrast, I took a crack at Friday's Fermi problem myself. Given the amount of energy the sun produces, how much makes it to the earth's surface, the heat capacity of air, and the volume of an average house (2219 square feet on average, according to the last US census, with a 10 foot ceiling, I assumed), my rough calculation results in raising the temperature of the house from a cool 70 to over 100 over the hottest part of the day. Similarly, the Cool Colors folks report that regular old roofs can get up to 70 degrees hotter than the air around them, thanks to their amazing ability to absorb the sun's rays and hold on to heat. So if you're scratching your head and wondering if this "white roofs" idea is worth all the hullaballoo, take a look at the research being done by actual scientists. It's great that so much of their work is available online, especially with an issue that could really affect the planet—and your summer electricity bill. Good try! I think the problem is as you hinted: leaving it up on the hot roof for long enough allowed the boxes to reach the ambient temperature. Given much insulation the very hot box-top won't be raising the temperature much above ambient if at all. A house is not like this though: The A/C constantly pumps heat energy out, so the question is of how much energy, not just the maximum equilibrium. I suggest re-doing the experiment (or maybe I will once I get settled in to my new digs) and measuring how long it takes to reach equilibrium. The longer it takes, the less energy is being applied. The less energy, the smaller the A/C unit required, and therefore less total power consumption. Thanks for the follow up! Keeps us all thinking about these very, very importaint questions.